I was in Romancing the Home the other day; it's a lovely home decor store in the heart of Ocean Park Village. Jill, the owner, and I were just chatting when a woman came in to look around. In passing, she then asked if she could trade her older Sid Dickens decorative tile "Memory Block" for a new one. It had been a gift for her collection but she'd never really liked it so was wondering about an exchange. I was a little taken aback to hear her request. But Jill was gracious -- saying no she didn't do exchanges like that because her clients only buy new product from her. But she pulled out a sheet of older Sid Dicken tiles to see if the visitor's tile had been "retired". This is where the conversation started to get interesting. Sid Dickens is a Vancouver sculptor whose hand-made blocks have become popular world wide. His work is only available at one store in each city and the tile selection at any one time tops out at about 100. When he designs new tiles, he takes some of the older ones out of circulation. To date, just over 400 pieces have been made. 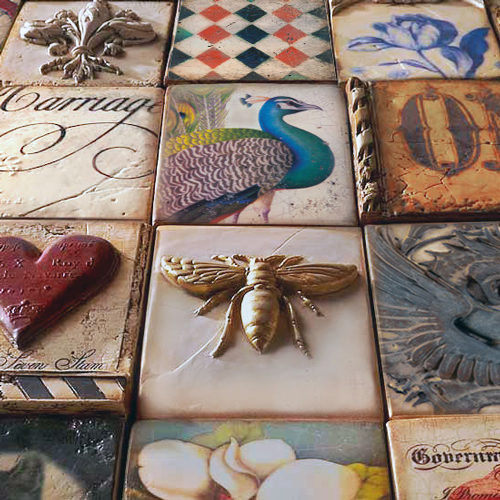 Each tile has a name, a number and a story that goes with it. (See example below) The older ones increase in value as they become scarce. In this particular instance, the visitor's tile had likely increased in value by between $150 and $500. If Jill had been dishonest, she could have said, "Sure, I'll trade you." and then resold the tile online and made a tidy profit. Instead, she made the visitor's day by sending her off to either re-sell the tile for a profit herself or keep it knowing it was growing in value. Jill sells Sid Dickens Memory Blocks for $83. They're available online for $98 at www.siddickens.com If you want to buy one in Whistler you can pay $150. Buying at Romancing the Home means you get the blocks for less from a reputable dealer. Shopping local makes sense on so many levels, don't you think? If you're interested in the new Spring Collection, drop by Romancing the Home (1637 128 Street, South Surrey) soon.